In 1960, Kenneth J. Allred, Jim's father, created a comfortable home for families going through the experiences surrounding a funeral. Ken worked in a very personal way, putting the emphasis on "home" from the very beginning. 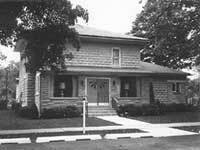 After Ken's untimely death in December of 1965, Paul Mayhew purchased Allred Funeral Home as a companion business for his Edwardsburg home. In June of 1976, Jim Allred purchased the home in Berrien Springs, continuing what his dad had started over fifteen years earlier--a tradition of handling the everyday duties of a director in a sensitive way. Jim Allred earned his mortuary science training from Wayne State University in 1974, training that he continues to keep current through his membership in the Michigan Funeral Directors Association and the National Funeral Directors Association. Together Jim and Karen have served the community for 40 years, making improvements and updates to the facility. They continue to strive for what Ken started - a place of comfort for people facing the hardest times of their lives. Come in and talk with Jim. Let him make your family comfortable in the Allred Funeral Home as you express your concerns and questions. Allow him to help you define the services you want, and let him take care of the details. You'll find that the service he provides is your service. The funeral home in 1960.